In this groundbreaking work, Bruce HoffmanAmericas leading expert on terrorismbrilliantly re-creates the crucial thirty-year period that led to the birth of Israel. Drawing on previously untapped archival resources in London, Washington, D.C., and Jerusalem, Anonymous Soldiers shows how the efforts of two militant Zionist groups brought about the end of British rule in the Middle East. Hoffman shines new light on the bombing of the King David Hotel, the assassination of Lord Moyne in Cairo, the leadership of Menachem Begin, the life and death of Abraham Stern, and much else. 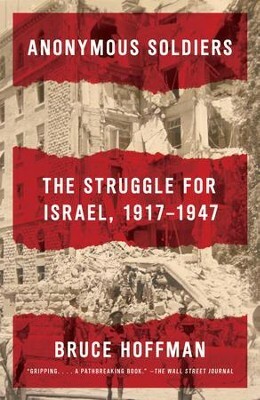 Above all, he shows exactly how the underdog "anonymous soldiers" of Irgun and Lehi defeated the British and set in motion the chain of events that resulted in the creation of the formidable nation-state of Israel. One of the most detailed and sustained accounts of a terrorist and counterterrorist campaign ever written, Hoffman has crafted the definitive account of the struggle for Israeland an impressive investigation of the efficacy of guerilla tactics. Anonymous Soldiers is essential to anyone wishing to understand the current situation in the Middle East. Bruce Hoffman is the director of the Center for Security Studies and director of the Security Stud&shy;ies Program at Georgetown Universitys Edmund A. Walsh School of Foreign Service. He is also a senior fellow at the U.S. Military Academys Combating Terrorism Center. His previous books include Inside Terrorism, The Evolution of the Global Terrorist Threat: From 9/11 to Osama Bin Ladens Death, and The Failure of British Military Strategy Within Palestine, 19391947. I'm the author/artist and I want to review Anonymous Soldiers: The Struggle for Israel, 1917-1947 - eBook.